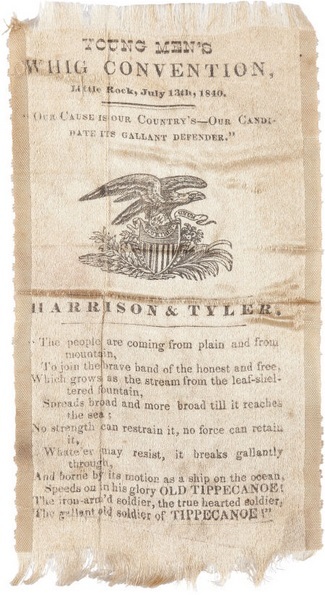 A campaign ribbon from an 1840 Harrison and Tyler rally in Little Rock. 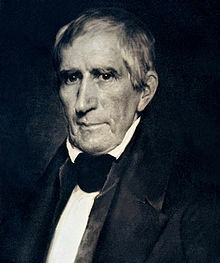 On February 9, 1773, future US President William Henry Harrison was born in Virginia. Though he would later be viewed as a frontiersman (which he was), his early years were spent on a family estate as part of one of the FFV’s (First Families of Virginia). At the age of 18, he was commissioned in the US Army and began an illustrious military career which spanned the Northwest Indian War and the War of 1812. This career took him into the wilderness areas of the US, which at the time were Indiana and Ohio. Harrison launched his political career in 1798 when he was appointed treasurer of the Northwest Territory. The next year, he was elected to represent the territory in Congress. In 1801, he was named Governor of the Indiana Territory. In 1811, while still Governor of Indiana, he led troops to defend against a Shawnee attack in the Battle of Tippecanoe. The following year, with the outbreak of the War of 1812, he continued to command armies in the northwest areas of the US. In 1813, he scored a major victory at the Battle of the Thames in Canada. This solidified him as a war hero with the public. In 1814, he was appointed by President Monroe to oversee negotiations with Indians. In 1816, he was elected to Congress from Ohio and served until 1819. In 1824, he was elected as a US Senator from Ohio and served until 1828. He was sent as minister to Columbia in 1828 and served until the Presidency of Andrew Jackson in 1829. Returning to private life, he ran for President as a Whig in 1836. At the time, the Whigs ran several candidates hoping to split the vote and send the election to Congress. Harrison narrowly lost Pennsylvania and its 30 electoral votes. (Though since the Democrats retained Congress in the election, it was expected that Van Buren still would have won.) Four years later the Whigs coalesced behind Harrison. Though his opponents tried to paint him as old, out of touch, and backwoods, he and running mate John Tyler (also a landed gentry from Virginia) embraced the depiction. They felt it helped them relate to the average voters and, in turn, painted Van Buren as out of touch and elitist. Though Arkansas’ electoral votes went to Van Buren, Harrison ran fairly strong in the state. He narrowly captured Pulaski County and ran strong in the southeast portion of the state. Harrison served in office only one month. While at the time it was believed to be related to the weather at his inaugural (and his record-long inaugural address), subsequent analysis has shown it to be due to entric fever, the result of a bacterial infection. Harrison Street in Little Rock is named for him. His grandson, Benjamin, the only grandson of a President to serve also serve as President, is skipped in the row of Presidential streets. This entry was posted in Government, History, LR Look Back and tagged Andrew Jackson, Benjamin Harrison, John Tyler, Martin Van Buren, War of 1812, William Henry Harrison by Scott. Bookmark the permalink.